They just needed to do the opposite of what they do with vehicles in Detroit. And the second guy in the red bag is up next. If this is happy, what the hell do we do when we’re sad? 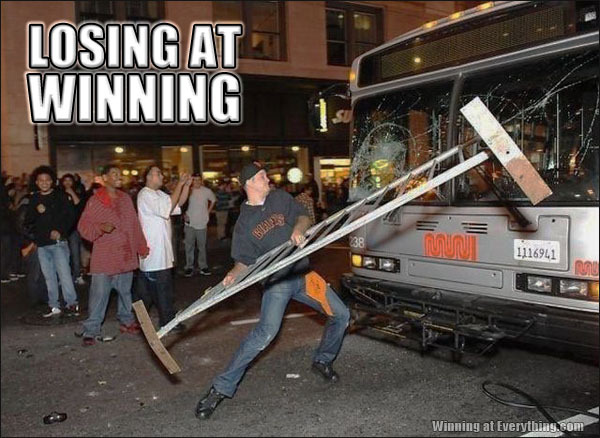 Well, if Vancouver’s Stanley Cup loss is anything to go by… exactly the same thing. Please tell me this isn’t one of those things where the idiot WINNERS riot and trash the place. We’ve evolved at least a little in the past few years, haven’t we? He was just trying to hand the Jolly Green Giant his crutch. Say what some of you will about NASCAR fans, but at least they don’t go trashing the town when someone wins a race or the championship. Maybe a couple of fights in the parking lot, and then they all pass out, but that’s about it.